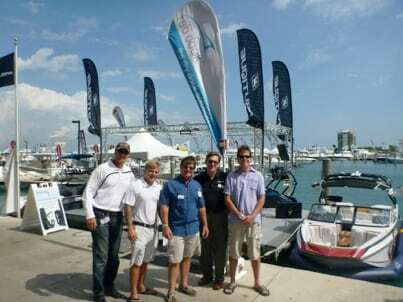 FAB Dock Team USA (Joe, Donnie and Pat) teamed up with Everglade Boats and Stella Marine out of Palm Beach to display a 27.5ft. center console sport fish wrapped in a FAB Dock at the Palm Beach Boat Show. 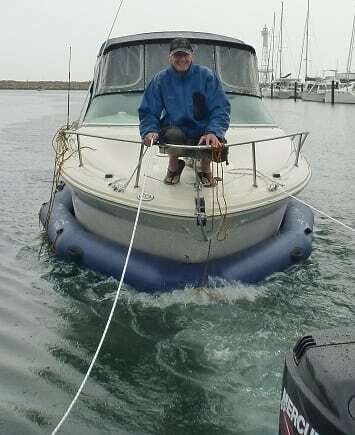 We had the perfect location, on a corner berth just down from the main entrance to the show, and were inundated all weekend with boat owners that were amazed at how such a simple concept was so effective at keeping the boat dry. 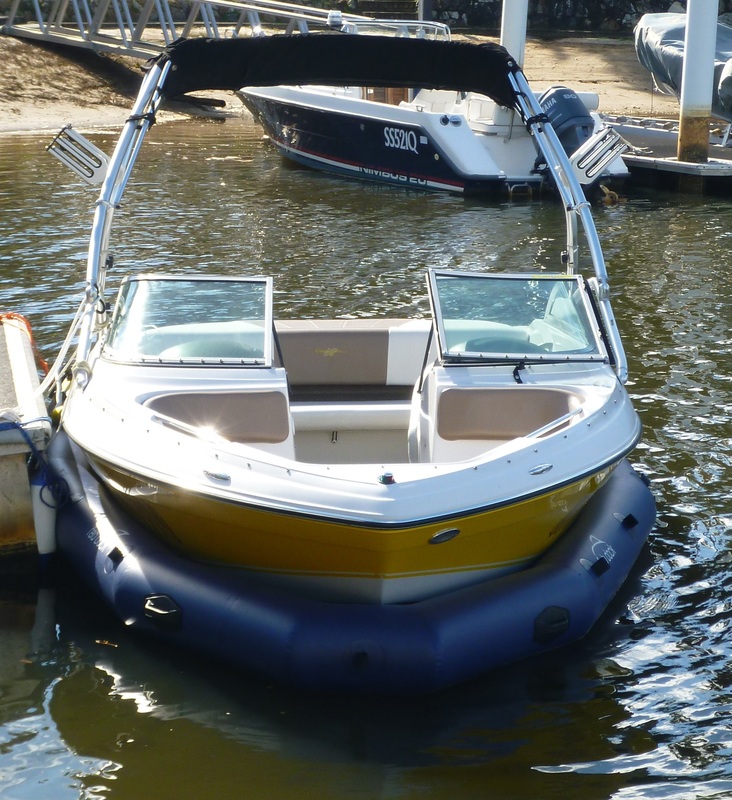 And when we explained that it also helped them park their boat, was portable, 12 volt and built to suit any size boat, they were truly flabbergasted. And no boat is ever complete without at least some rain. So right on cue, we received our mandatory rain shower on the first day, but the weather gods were kind to us for the rest of the show. Unlike the Sarasota Boat Show, which we aren’t even going to talk about. Response continues to be amazing and interest was even higher in Palm Beach than at the Miami Boat Show a few weeks weeks before. Brian Harris, the VP of Marketing for Everglades Boats, Inc. loved the crowds around the FAB Dock so much he wants to team up for future boat shows and continue to showcase his boats in a FAB Dock! Many thanks to Bob Stella and the great staff from Bob Stella Marine who showed such class at the Palm Beach Show. They were such a great team to work with! What a week. 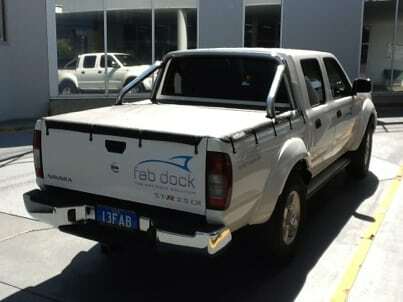 A big thank you to the whole FAB Dock team for pulling out all stops and getting seven FAB Docks installed this week on both sides of Australia. And an even bigger thank you to all those customers that worked in with us and rearranged their schedules to allow it to all happen. We almost had Queensland covered with FAB Docks being installed over 1000 kilometres apart from Brisbane to Airlie Beach with Scarborough and Mackay in between. 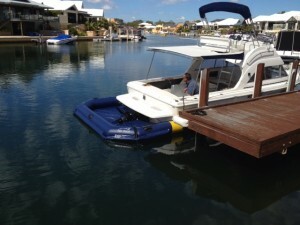 And over on the West coast, Guy installed another two in Mandurah and another one in Hillarys, right next to another FAB Dock customer; they look so cute together. It makes us all so proud. But there is no rest for the team with another seven scheduled to be installed over the next week. The production team are workng around the clock to keep up. But you won’t hear any complaints from us. We love being busy and sincerely appreciate all our customers making us the number one selling dry docking system in the world. 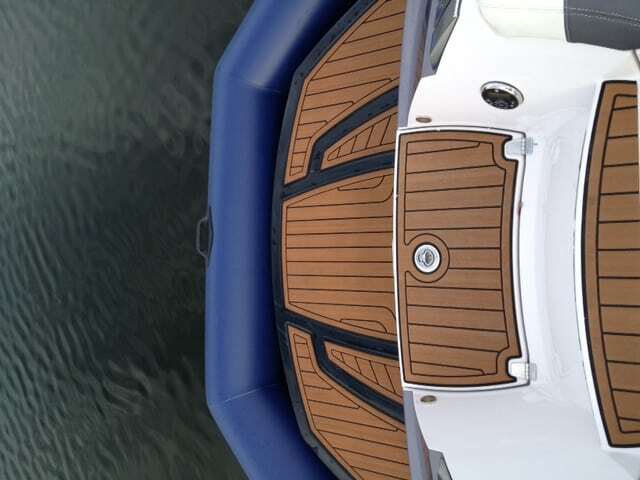 If you don’t have a FAB Dock under your boat yet, give us a call and find out why so many other people have chosen a FAB Dock to protect their boat. 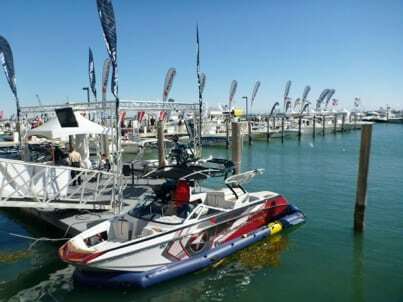 Western Australia finally broke the Boat Show weather hoodoo with three magnificent days for the Hillarys Boat Show. Not including the setup day where Guy and I got absolutely soaked setting up Scott’s great Sea Ray Weekender that he had graciously lent us for the weekend. The crowds loved the perfect weather and flocked in. Lisa put on an absolutely wonderful show with lots of entertainment for everyone and lots of stuff to buy ranging from fishing tackle to multi million dollar Princess boats. And of course, the response at our FAB Dock stand is always amazing; ranging from bewilderment to absolute amazement at how simple and cost effective our dry docking system is compared to anything else in the market. 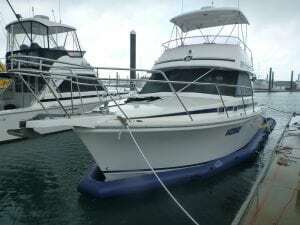 With more and more people becoming aware of the environmental impact that thousands of boats dropping antifoul into our waterways for years and years will ultimately produce. 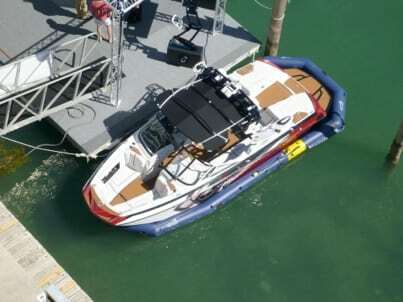 So here’s hoping that in a short period of time we will see most recreational boats living in FAB Docks rather than using poisonous antifoul. 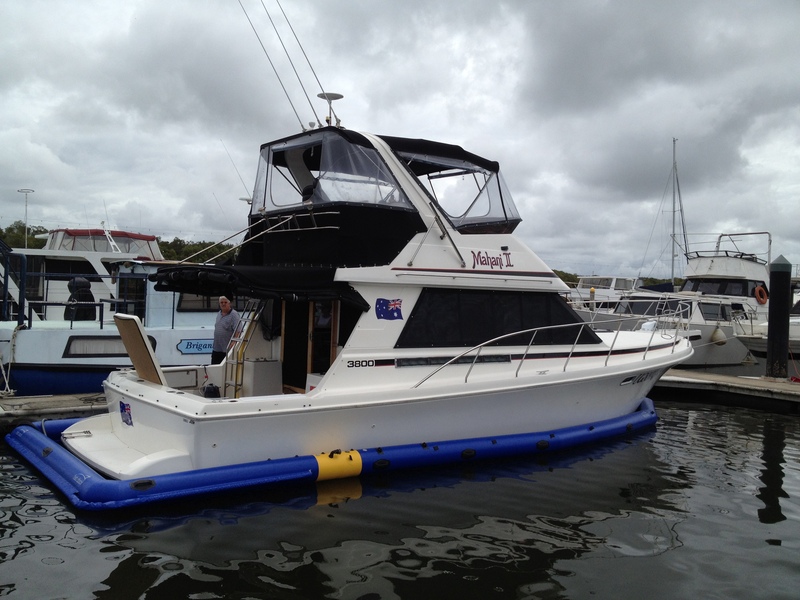 Shane and Sonya are the latest boat owners to join our rapidly expanding FAB Dock family. 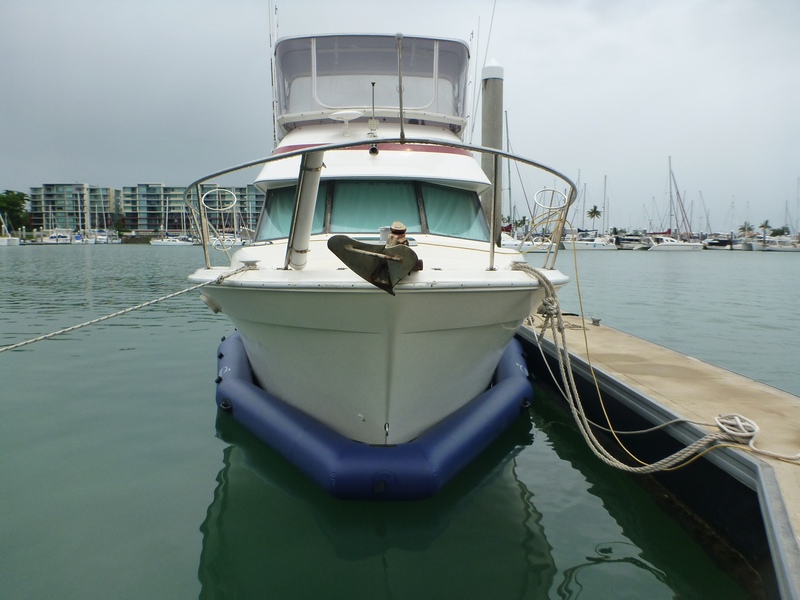 It is surprising that it has taken this long for Townsville to get its first FAB Dock but Shane is convinced that now that fellow boaties can see how easy and effective his FAB Dock is, they will all want one. Shane had long been looking for a solution to the age old problem of growth on his hull and running gear (like the rest of us) but could never justify the cost of previous dry docking systems. 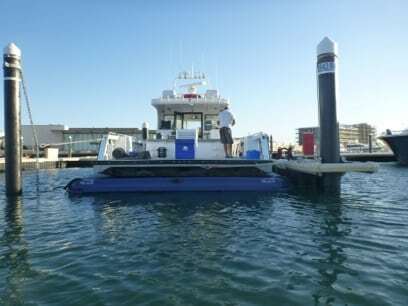 But when his big Volvo diesel was struggling to push his boat to 12 knots, down from 20 knots when clean, he had another look for a solution. 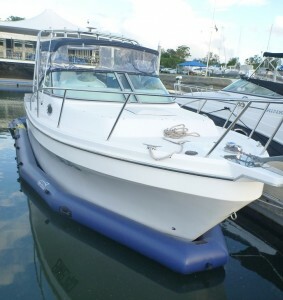 So when he found FAB Dock, and also saw how it will help him berth his boat, he was sold. 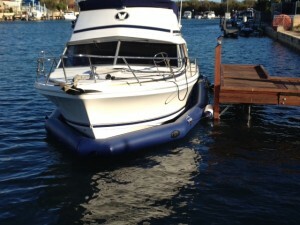 Having a single engined flybridge on a ‘blow off’ berth, he couldn’t find a more difficult boat to park. With his ‘crew’ either asleep or not quite up to the task, it was always a three or four attempt effort to get the Riviera berthed without the obligatory “berth’ marks. So now he is looking forward to being able to go fishing on his own, knowing he can park it first time, every time. 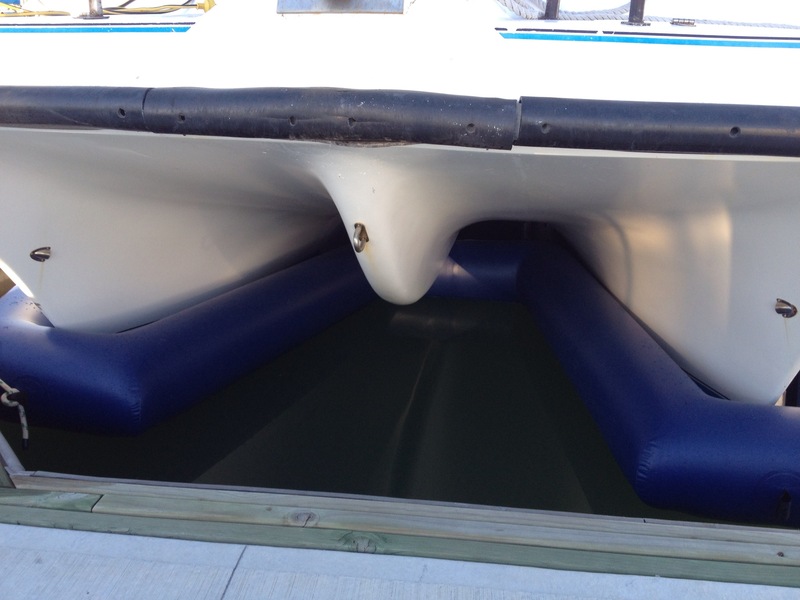 And have a look at just how good a fit we got around the boat. Shane took all the credit for this as he was the one hanging off the bow with tape measure in one hand and bow rail in the other, while I was sitting on his boat with my feet up writing down the measurements he was yelling out. So thanks for that, Shane. Congratulations to Barry for now becoming our biggest customer. Not himself, being a fit and healthy bloke that he is, but his boat. 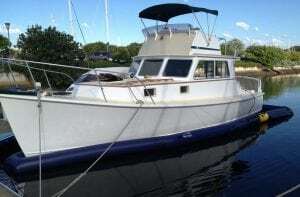 “Lucky Grey” is a purpose built boat by Strategic Marine that stretches over 50 feet long. And its ‘purpose’ is to get Barry’s wife out to the islands before she gets sea sick. What a caring, thoughtful and romantic husband. To achieve this goal required 1400 horsepower of diesel energy and surfacing piercing drives. Any wife would have shed tears of joy over such a beautiful Valentine’s present. 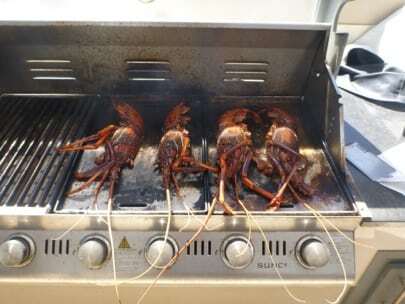 It gives me an idea for Valentine’s Day next week, mmmm. At 39 degrees (102 Fahrenheit) the day we installed it, we greatly appreciated the ice cold water and being able to step into the air conditioned cab. Thanks for all your help Barry and I look forward to a trip out the next time I am in town. We have dozens of brands of boats now living in FAB Docks so it is always great to welcome another brand into our friendly FAB Dock family. 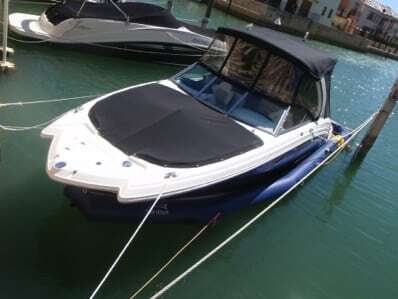 Colin doesn’t believe in starting at the bottom and so decided his first boat should be a 264 Chaparral Sunesta. 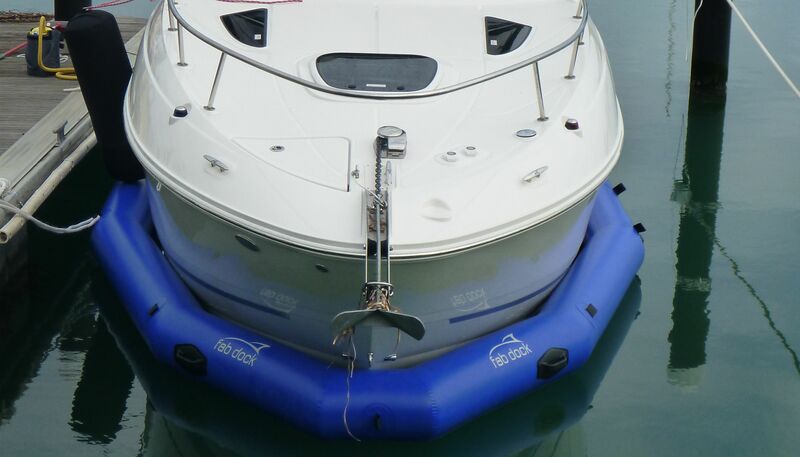 Even allowing for our own bias towards our own brand of boat, there is little argument that that is one very special boat. Congratulations.